I am fascinated by the process of art: how a fragment of a dream in the mind of an artist is conceived and brought to eventual fruition. 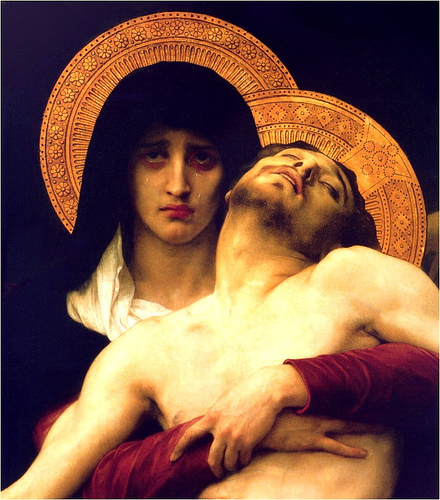 So often, I think, we encounter great masterworks, whether they be paintings, musical pieces, or novels, and perhaps fail to take into account everything that had to happen for this work to come into being. It is a rare privilege to peek into the inner workings of the mind or eye of the artist, to see his hand at work in the process of creating beauty. The Huntington Library and Botanical Gardens in San Marino is offering just such a rare peek into the work of creating waking dreams of beauty. 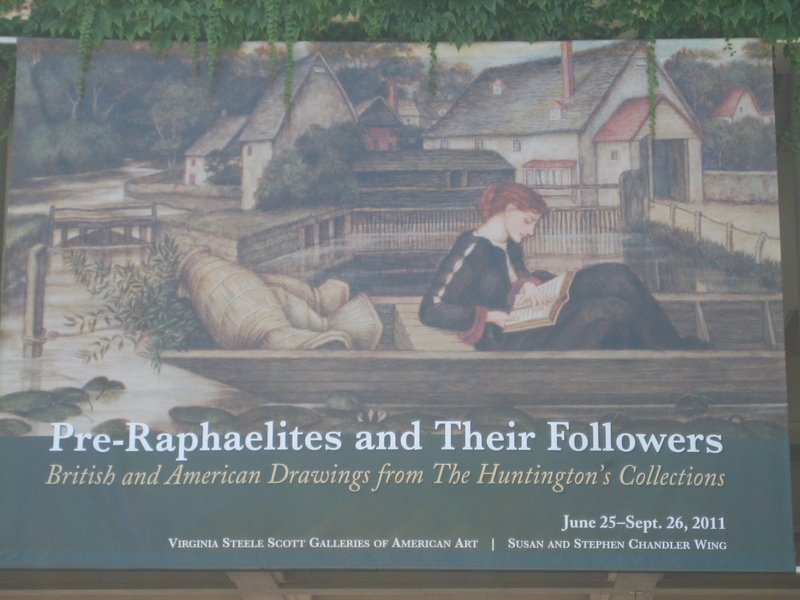 The exhibit “Pre-Raphaelites and Their Followers: British and American Drawings From the Huntington’s Collection” is on view through September 26 and is worth a beauty break if you are in the area. Incidentally, if you are unfamiliar with the Pre-Raphaelites and their distinctive contribution to 19th century arts and letters, Stephanie Pina provides a brief but excellent overview, along with some helpful links, on her lovely website dedicated to all things Pre-Raphaelite. One of the primary goals of the Pre-Raphaelite Brotherhood (PRB), which included the artists Dante Gabriel Rossetti, William Holman Hunt, and John Everett Millais, was to renew British art and literature, in particular through the faithful observance of nature. Many people think their influence was limited to the United Kingdom; this exhbit dispels that idea, showing clearly how the theories, techniques, and philosophy of the PRB moved across the pond and found great sympathy among a group of American artists, architects, and geologists who formed their own group — The Society for the Advancement of Truth (SAT) — modeled after the PRB. Though tiny — only 37 drawings — the exhibit was a revelation. There were careful studies of larger, more well-known works by the British artists which revealed the detailed and painstaking processes involved in making the dreams in their minds come to life. Most of the American artists represented focused on landscape painting, everything from the domes of Yosemite in the Sierras, to the Hudson River Valley, and beyond to Florence. There were also two small detailed landscape studies by Walter Crane. 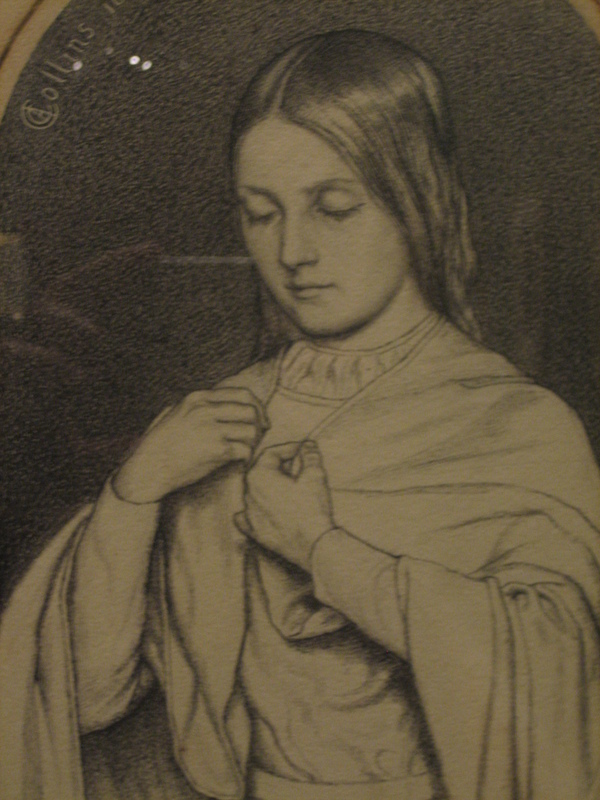 Several American Pre-Raphaelites in fact had a very close relationship with the British critic John Ruskin, an artist in his own right, who was credited with spreading the philosophy of Pre-Raphaelitism through his many writings and patronage. Two of these American Pre-Raphaelites, Henry Roderick Newman and Esther Frances (Francesca) Alexander, were represented in the exhbit. Ruskin’s own drawing of the crumbling castle walls of Kenilworth was on view as well. Highlights included “Andromeda,” by Edward Burne-Jones as part of a study for his larger The Rock of Doom in his Perseus Cycle. A head study of a woman by Rossetti and another series of studies by Frederick Sandys were significant. There were four gorgeous miniature studies for The Lady of Shallot, by William Holman Hunt. These in particular give a sense of how the artist tries to conceive of the image from different viewpoints. And many times, as in this case, the end result looks nothing like the original conceptualization. Finally, in juxtaposition, one of the few original existing copes of the first volume of the PRB’s journal The Germ: Thoughts Toward Nature in Poetry, Literature, and Art displayed next to its American sister SAT publication The New Path: A Monthly Art Journal. It was hard to choose any one piece as a favorite, but I suppose there were three that absolutely stood out for me. Charles Allston Collins “Beati Mundo Corde” was almost photographic in its precision of the young nun’s facial features. “Isabella Boccaccio,” by John Riley Wilmer alludes to the 14th century Italian poet Boccaccio’s The Decameron, a favorite of the Pre-Raphaelites. The piece might also be a reference to John Keats’ poem “Isabella and the Pot of Basil,” which is itself derived from The Decameron. Incidentally, Holman Hunt painted his own Isabella. I tend to like the layered quality of the narrative paintings of the Pre-Raphaelites — every picture tells a thousand stories and there are so many details to linger over. Finally, this “Head of a Girl,” a study in gold tip on prepared paper by John Southall is simply breathtaking. She is truly a glimpse of the ideal of Pre-Raphaelite beauty in every way. Beauty Break Bonus: One gallery in the Huntington’s British Art Museum holds original furnishings, textiles, and ceramic tile pieces by William Morris and Co. Be sure to sneak a peek down the staircase at the end of the gallery for a floor to ceiling Morris stained glass, with art work by Edward Burne-Jones. I was unable to photograph this, but here is a link to a lovely photo taken by someone else. Gorgeous……..